This is part one of a multi-part effort to examine the "facts" presented in the DEA guide to "Speaking Out Against Drug Legalization." Fact #1 states, "We have made significant progress in fighting drug use and drug trafficking in America. Now is not the time to abandon our efforts." "To put things in perspective, less than 5 percent of the population uses illegal drugs of any kind. Think about that: More than 95 percent of Americans do not use drugs. How could anyone but the most hardened pessimist call this a losing struggle?" 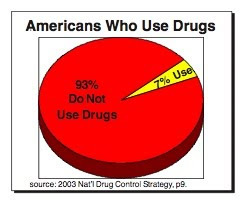 Clearly, this leaves the reader confused as to whether 5% or 7% of Americans use drugs - a difference which would translate into millions of more drug users. This document is six years old, and it's been reviewed by many others, so if I am missing something obvious that makes both statistics valid then please correct me. Interestingly, Josh from AboveTheFlat.com further deconstructs the accuracy of the 95% number and suggests the actual drug use rate is much higher. From LEAP's perspective, it is misleading to suggest that "now is not the time to abandon our efforts." A shift in drug policy would not mean the effort and energy put into reducing drug use would disappear. The effort from law enforcement would still be there. But it would be focused in a more humane, more productive and less harmful direction. I just read the pamphlet. It is full of misconceptions and misleading "statistics". When are they going to learn that honest education is the key and not lying propaganda? I think they have gotten so used to lying that they can't tell the truth! As I get older I realize the way the government, and other institutions, can manipulate us. I don't like being manipulated. And all of their pictures of drugs? Are they promoting drugs, themselves, with these actions? Is that what they really want kids to see? It is almost counter-productive. It really seem like a dumb move! And their rant about alcohol and cigarettes seem ingenuous, knowing the fact that, way too, many are smokers! Some of them have even committed crimes while intoxicated on alcohol (cop beating in Chicago bar, is just one example). But, they are cops. They get treated differently! They are a bunch of alcohol elitists, at least that is my two cents worth about it. I better stop, My blood pressure is rising! Next, to anyone who lives in reality and actually tries to accomplish things, either 95% or 97% is a grand accomplishment. If I rec'd a 95-97% on a test I'd be excited. If I was running for office and had that many of the votes I'd be floored. If I was trying to convince the public to adopt a belief I had and that many people signed on, I'd be jumping for joy. That doesn't mean I'd wonder about the missing percentages… but it sure would not be cause to rake myself, or others, over the coals. I think they have gotten so used to lying that they can't tell the truth! And all of their pictures of drugs? Are they promoting drugs, themselves, with these actions? Is that what they really want kids to see? It is almost counter-productive. This made me laugh and recall my own "drug education" in 6th grade. I had no concept of "drugs," but they brought in a big old suitcase, ready-made for just these lessons. Pills of all shapes, sizes, and colors, "uppers" and "downers" and all sorts of crazy names that it was more like a creative writing class, things I'd never seen or heard of before. Like you say, they spent a lot of time teaching me things that I really had no concept of and frankly didn't need to know, but seemed to be claiming was very important. These people are experts at making problems, then they want to "ride" in like the calvary and rescue us from the problems they made. I can't even say what the message I got from it was; it was so long ago. But I sure don't recall being afraid of them or even the message to "stay away." Elementary school was so long and boring, so much sitting in chairs! Just adults forcing their way of doing things on kids as though kids learned best by being bored at a desk all day long. Surely these drug education classes were not designed by educators. Like you allude, they were more like a taunting to get us interested in all those items under plastic casing, and teaching us all the funny names they called them. Crazy. One statistic which the pamphlet leans on very heavily (complete with chart at the end) is the decrease/increase in reported use with increased/decreased crackdowns and restrictions. The implication here is that, when the climate is unfavorable for drug users (harsher senctences, higher budgets for enforcement, etc. ), drug use decreases, and the decrease is due to the increased measures used against drug users, therefore, harsher measures being so effective, they are justified and should be maintained and even increased. Problem with all that is that a.) self-reports of useage are not the same as actual useage rates, because b.) very few individuals with any survival instinct would report themselves, even anonymously, as using drugs during periods when highly negative sanctions for drug use are in force. There is simply no motivation for them the 'fess up, and indeed, some very good reasons for remaining silent regarding their own use, or denying it outright. News alert: DEA takes credit for a sudden drop in illegal drug use...in Washington and Colorado...last November...wait. What?